1996 release. Manchester-based Muslimgauze is one of the most uncompromising artists the music biz has ever seen. His music is as extreme as the political motivation that goes with it. For more than 15 years, Muslimgauze produced rhythmic music that defies any description. Sometimes lush ambient dub textures, sometimes fierce ethno rhythms. The events in the Middle East was his main inspiration. Organizations such as Hezbollah can find Muslimgauze among their supporters. Many of today's musicians owe a great deal to the Muslimgauze sound. That's why Staalplaat invited a host of groups from today's techno, house and related scene to take the extreme work of Muslimgauze and give that work dancefloor abilities. The reactions were overwhelming and the music goes in many directions. Therefore, Staalplaat present (with pride!) a double CD. Disc One ("Occupied Beats") takes you onto the dancefloor with the dubby music of O Yuki Conjugate and their off-shoots Sons Of Silence and Clicka, Drome, Extremadura, the fucked-up jungle of Self-Transforming Elves and the straightforward, house-y remixes of Human Beings, Elke Dag (who have a connection with Exquisite Corpse) or LØSD. 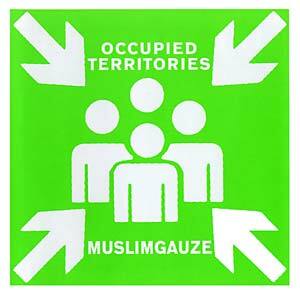 The second disc ("Occupied Frequencies") goes straight into weirdness, emphasizing the moody and atmospheric side of Muslimgauze, in remixes by Nonplace Urban Field, Zoviet*france and Quest. Also with the extremeness of People Like Us, Starfish Pool and the master himself, Occupied Territories is a remix tribute to one of the strongest voices in music.